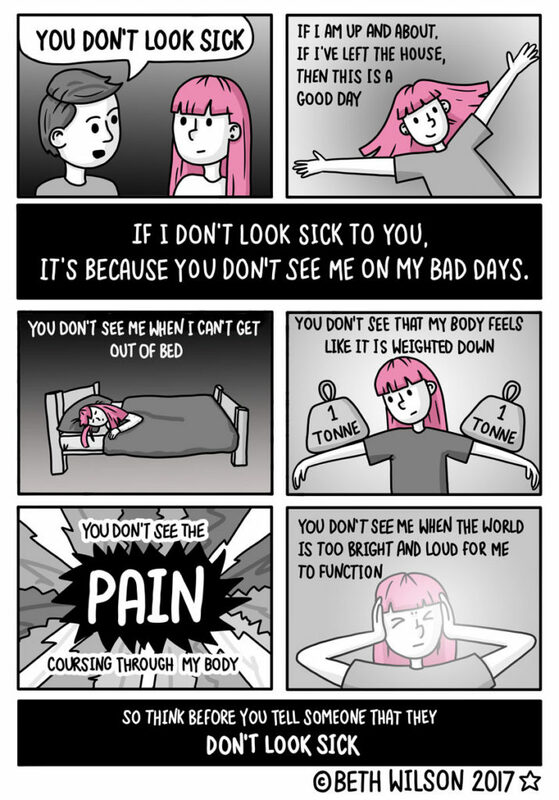 It’s ME Awareness day so I made this for everyone with ME and other invisible illnesses. I’ve had Fibromyalgia for nearly thirteen years. Four years ago I was struck down with ME and spent the best part of three years in bed. Then I improved and it was amazing. Something went wrong a few months ago and I’ve become more ill again. That’s the nature of this illness. It fluctuates. There are good times and bad. I am lucky that I can work from home. Some days I can’t work at all, some days I can do more. I couldn’t do any of it without Daz being amazing and supportive and I couldn’t get through day after day of exhaustion and bed rest without the kitties. I’ve been in dark places with this illness, wanting to give up, thinking I can never have anything that resembles a life. Feeling so depressed that life didn’t seem worth living. Things do get better though. You learn to cope, to make the most of what you can do. Yes life is different to other people’s but it doesn’t have to be all bad. There are always good things, good people, good cats that will give you the strength that you need. We might not always look ill (although believe me, I look pretty dreadful a lot of the time) but don’t minimise our struggles and how much effort it took to get here. Believe us when we say we’re sick. Please. I am so glad I found your cartoon. It came up on my Facebook page, and I was trying to post it to the Crohn’s and Colitis group but since we email each other, I couldn’t post it. Then the cartoon disappeared. I have Ulcerative Colitis, and I just have to be able to get back to work. I see you work at home. Do you work as an artist from home or what? My short term disability is running out, and for now, with all of the fiddling around the doctors do waiting for medicine to work that never does, I am out of savings. I like your drawings. I am an artist, more specifically a photographer but I don’t like to go places that are not near a bathroom so it limits where I can go. There is a lot of fatigue and pain with Crohn’s and Ulcerative Colitis, too.